MINNEAPOLIS/ST. PAUL — The University of Minnesota College of Veterinary Medicine (CVM) will honor Skyview Dairy of Hutchinson, Minn., as recipients of the 2018 Dairy Appreciation Award. The family dairy will be recognized with the award April 19. Skyview Dairy Farm is a family owned and operated dairy farm that has been in continuous operation since 1968. Daryl Luthens started the business with seven cows, and today he and his four sons manage a milking herd of 1,150 cows. They employ a staff of 19 people and make it their mission to give each cow their undivided attention as if she were their only cow. Their proximity to campus (roughly 60 miles outside the Twin Cities) combined with their tradition of excellence has made them a high-quality partner for the University of Minnesota. 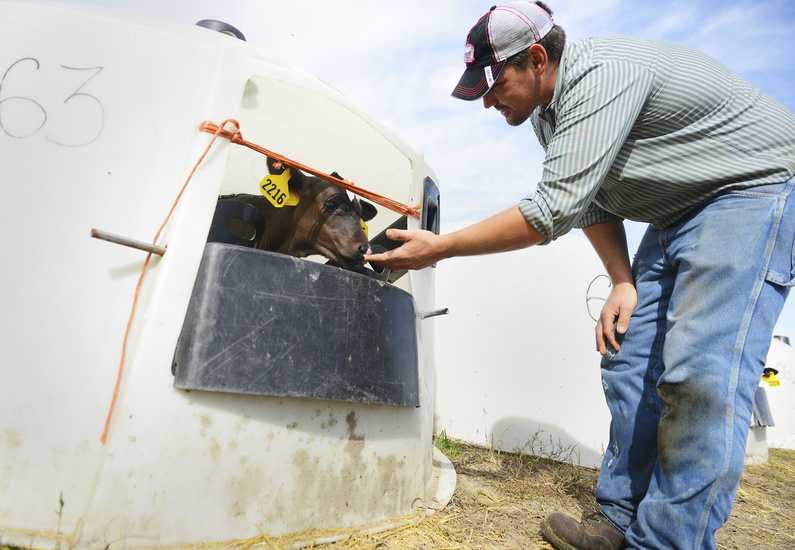 Skyview Dairy has helped improve dairy health worldwide by supporting the College’s DVM teaching and research programs. They have participated in multiple applied research studies and have acted as a host for herd investigations performed with our students as part of our 'Advanced Dairy Production Medicine' rotations. “Having supportive dairies like this is incredibly important to successfully achieving our mission,” says Sandra Godden, DVM, DVSc, professor in the Department of Veterinary Population Medicine. The Dairy Appreciation Award is presented at the Annual Minnesota Dairy Health Conference each spring, in recognition of producers who have made outstanding contributions to the Minnesota dairy industry and for supporting teaching, research, or outreach missions at the College of Veterinary Medicine. The 2018 conference will be held April 18-19 at the Continuing Education and Conference Center on the U of M’s Twin Cities campus in St. Paul.